Acts of Kindness is a teen volunteer group that was started by a student at East Forsyth High school, McKenzie Landis. McKenzie is an honor roll student and a competitive dancer. She has a very busy schedule juggling academics and 14 hours of dance practice a week. Because of her demanding schedule, McKenzie found it very hard to participate in the service-based clubs offered at her school. Her parents encouraged her to find new ways to give back to the community at times when she was not busy with her other commitments. Initially, McKenzie signed up to volunteer by herself. However, when she saw how great the need for volunteers was, she approached her mother with the idea of starting a teen volunteer group. 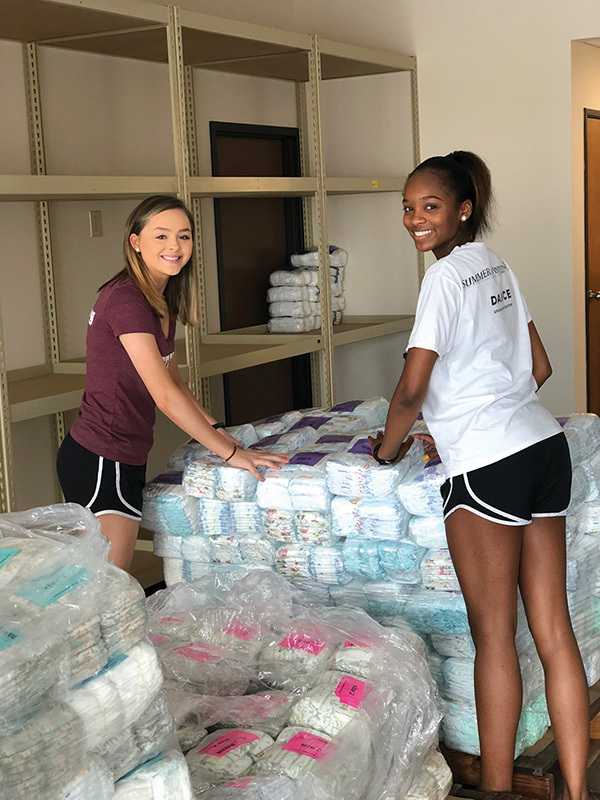 She thought that if she could gather a group of friends to volunteer with her regularly, they would be able to make a greater impact on the community. She began to research different organizations online and found “generationOn”, an organization committed to providing tools and resources for kids and teens seeking to volunteer. Individuals can create groups within the generationOn community. They then have access to resources that help grow their group. As McKenzie considered a name for her new group, she remembered a Bible verse in Acts 20:35, “It is better to give than to receive.” Acts of Kindness was born and became a perfect name to describe the heartbeat of this group! She immediately went to work organizing the first Acts of Kindness meeting. She emailed letters to eight girls that she considered perfect for the group and was surprised by the overwhelming response. They held their first meeting on November 14, 2017, at a local coffee shop, and have not looked back since. As the leader, McKenzie found organizations in need of volunteers, contacted them, and scheduled service projects for her team. Acts of Kindness also has an adult mentor who supervises all their volunteer events and provides guidance and wisdom to the group. They have served with Samaritan Ministries, Kate B. Hospice home, the Ronald McDonald House, and the Children’s Home Society of North Carolina. The group has grown tremendously and now has 22 teen members. They have volunteered a total of 420 hours since November 2017. In a culture that is so wrapped up in serving self, it is easy for our teenagers to grow up without a sense of gratitude for what they have and empathy for what other’s do not have. Acts of Kindness is a group of teenagers committed to making a difference in the lives of those who are less fortunate. Last December the group was able to provide Christmas gifts for a local family in need. When their mentor, a nurse at Wesley Long Hospital, told them about a co-worker’s husband who had collapsed and needed a heart transplant, Acts of Kindness jumped into action. The co-worker was spending all her time at UNC hospital away from her two small children. She had also exhausted all their savings trying to place her husband on the transplant list. The group mentor acquired the children’s Christmas lists, and then Acts of Kindness accepted donations from family and friends. Thankfully, the donations were enough to take care of everything on the lists. They shopped and then delivered the gifts to the grateful mother in enough time for her to wrap them and surprise the children on Christmas day. The family was filled with joy and thankfulness because of the thoughtfulness and generosity of our community’s teenagers. McKenzie is now a senior at East Forsyth High School and is very passionate about dance. She has plans to continue her education and obtain a Bachelor of Fine Arts in dance with a minor in business. At her request, the team mentor has agreed to continue serving with Acts of Kindness. She firmly believes our teens should value giving back to their community. Her greatest hope is to bring awareness to the group, see it flourish and grow, and for Acts of Kindness to make a positive impact on the Kernersville community for years to come. If you are interested in learning more about the group or if you know someone who would like to become part of Acts of Kindness, please contact McKenzie Landis at kenzielan03@icloud.com.